So I’m going to set the scene for you. I go to the beach for a little mommy and daughter Spring Break morning. I don’t think it is all that warm so I wear yoga pants. I get there and realize that it’s super hot so I roll up my pants. The sight was not pretty, folks. Oh, the beach was pretty however, the legs, the feet, the toes…EEK! Everything needed a serious exfoliating session. 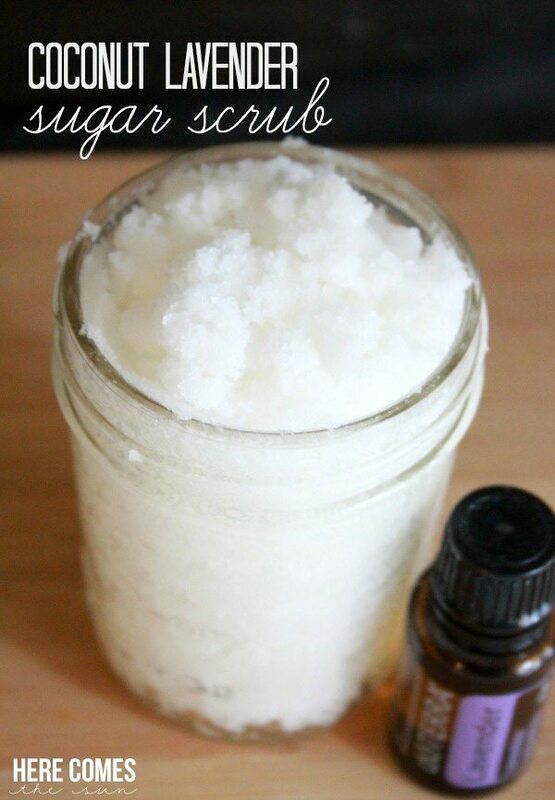 The dead skin has got to GO and this Coconut Lavender Sugar Scrub is the perfect way to get rid of it. This section contains affiliate links which means if you click on the link and purchase an item, I get a small commission from that sale. 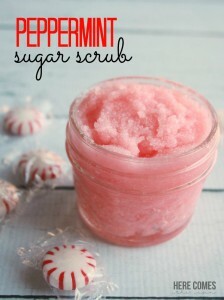 The basic recipe for this sugar scrub is the same as my other scrubs… 2 parts coconut oil to 1 part sugar. 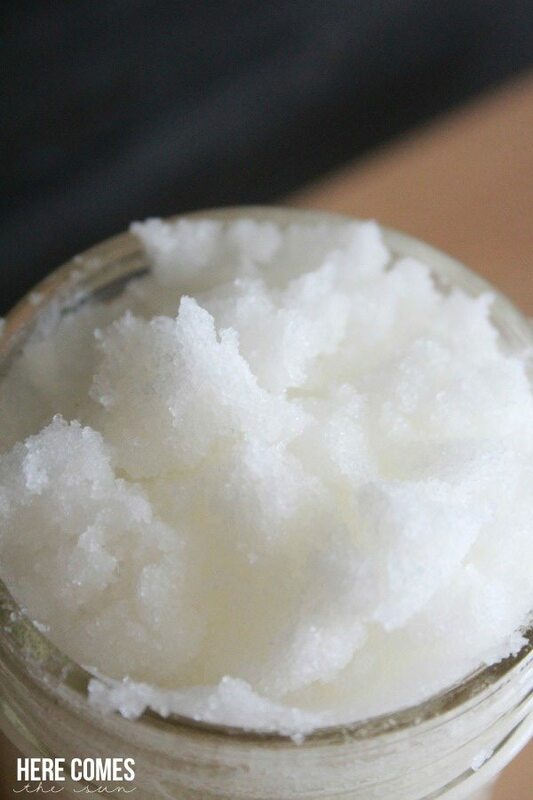 For this batch, I used 1 cup coconut oil to 1/2 sugar. 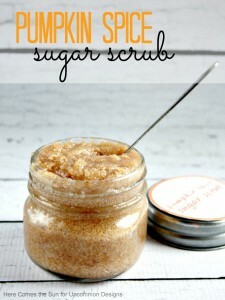 You can use either white sugar or coarser brown sugar depending on how much “scrubby” ness ( yeah, I’m declaring that a word) you want it to have. 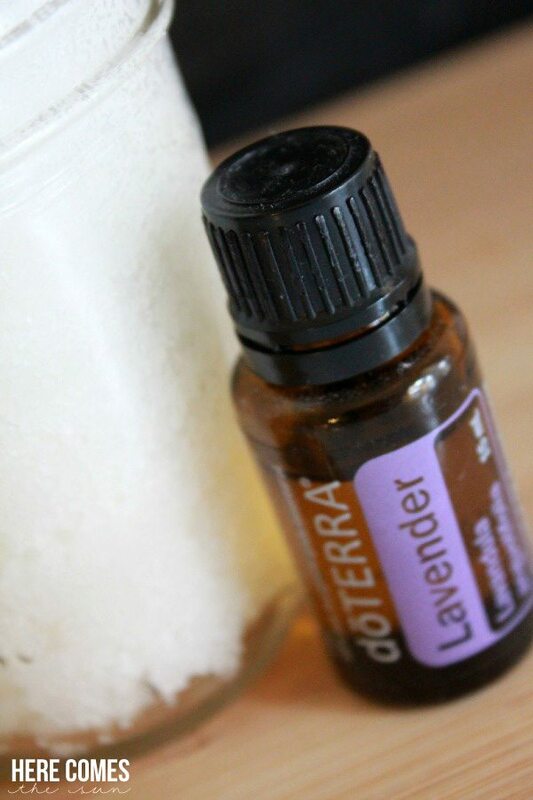 Mix together in a kitchen mixer and then add 5-10 drops of lavender essential oil. I use doTerra oils and I love them. And no, they are not paying me to say that. 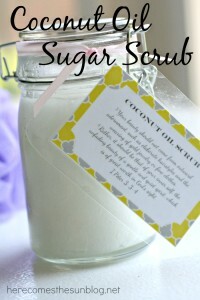 The amount of scrub made from this recipe fills the small mason jar shown above. My feet are going to thank me for this and yours will too. My sneakers will soon be pushed to the bottom of the shoe basket and my flip flops will be very happy to see me. Are you ready to get yourself beach ready? Hi Karen! First, thanks for subscribing to my emails! As for the printables that you are looking for, if you are referring to the sign in my most recent Spring Mantel post, it was not a printable. I purchased that wooden sign at Target. I’m not sure what post you are referring to regarding the “Spring Has Sprung” printable. I have not made a printable like that for my site. I did a guest post over at My Favorite Finds with a Spring Printable a few years ago so you may want to check out that blog and do a search. Hi Kelly I just wanted to know when you say drops of the oil are you speaking one hold dropper or just drops of drip drop Drip Drop? I don’t use a dropper. Just count the drops straight from the bottle.